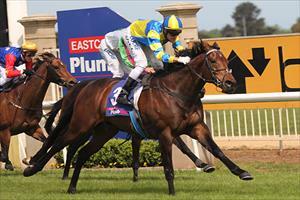 Our weekend kicks off at Moonee Valley on Friday night with runners in consecutive races – Ali Vital and Crimson Lady. Lining up in the seventh event, the City Jeep Handicap, promising four-year-old Ali Vital is having his first run since a Queensland winter campaign that saw him record an impressive victory over 2200m at Doomben. “He will get better as he gets over more ground,” Moroney added, nothing though that the son of Yamanin Vital was placed over 1509m (albeit in maiden class) first up last time in. The following race, the Sportingbet Handicap over 2040m, sees Crimson Lady as topweight – the five-year-old dropping in class after contesting a strong event at Flemington on Melbourne Cup Day. “She was disappointing that day,” Moroney conceded, noting that the five-year-old had been sound and rather unlucky at her two previous outings. However jockey Ryan Maloney has been in great form of late and hopefully we can see the best of the talented Volksraad mare. Earlier in the day at Pakenham we saddle up three runners – Malanco, Little Hero and Baqaat. Little Hero, who takes his place in the ratings 1300m event, has been freshened since proving disappointing as favourite over a mile at Wodonga in early November. Baqaat kicks off her summer campaign in a 1400m race and Moroney is looking forward to seeing her over more ground later on. To Caulfield on Saturday where the first of our two runners is Flashy Fella in the CFV Ambassadors Plate. He too has drawn the inside gate which, Moroney says, is pleasing. The winner of two in a row before a game second in the Silver Bowl on Ararat Cup Day, Murcielaga also looks a good chance at Caulfield – taking his place in the Ballymore Stables Handicap – a race it would certainly be apt for us to win! “His last defeat can be put down to the pace in the race,” Moroney said – noting that the in-form gelding got back to last off a tardy start in a slowly run affair, doing a great job to go so close.